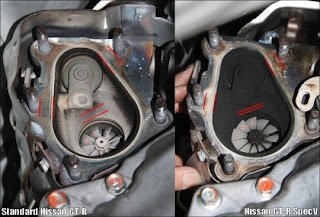 Over at GTR Blog , via the Garage Saurus Website, they posted up some pictures of the exhaust side of the Spec V turbo vs the Standard GT-R turbo. The pictures clearly show that the exhaust wheel in the Spec V is larger than the exhaust wheel in the standard car. A bigger exhaust wheel means less restriction, which should mean a little slower response down low, but a stronger top end charge. I would like to see some dyno charts of the Spec V, and then a Spec V with a little more boost.